First of all, I had a complete blogger fail and barely took any pictures. At least I was living in the moment, right? Then, the morning we let Liam rip into his package, I had been playing around in manual mode on my new camera and forgotten to switch back over to auto to snap these pics. So, don't judge the weird exposure, etc. Still learning over here! Probably will be for awhile. So... First the treats! Sara surprised us with M&Ms (Liam is quite the chocolate lover) and an elf Pez dispenser (one of my pregnancy cravings which I reluctantly shared). Liam has most definitely inherited my sweet tooth, so candy first thing in the morning is perfectly acceptable! She also gifted us with a set of the Original Christmas Classic movies!!! I have quite the Christmas movie collection but was missing Frosty the Snowman and Rudolph the Red Nosed Reindeer. So happy to have these now, so that I don't have to stalk the TV schedule to try and record them. And lastly, there was a copy of Little Blue Truck's Christmas! We actually had already bought this book, but it has quickly become a favorite, so I am happy to have an extra copy on hand. Especially with two boys in the house come next Christmas...now they can each have their own! If you want to see what Liam & I put together for two sweet boys, head over to A Tale of Two Maples. And a big thanks to Megan & Elizabeth for putting this gift exchange together! What a fun gift exchange! Lord I hope my little doesn't get my sweet tooth. And I have to ask where you got those steel looking letters over the bed...I'm looking for some for the nursery! Sara, Mac, and Mim did a great job! What perfect presents Liam got! Absolutely LOVE the picture of him wearing those adorable pjs sitting in his bed. So cute! So glad you guys liked the package! The day after I mailed it I saw that you already had Little Blue Truck Christmas - sorry! Maybe you can swap it with a friend for another book you don't have (we do that with friends). Merry merry Christmas! Great gifts... And I agree it can't hurt to have an extra copy of that book especially since you'll have two boys next year! We love that book over here too! how cute!! and I am dying over that moose! Rae would lose it over that guy. WE ABSOLUTELY LOVED THE BOOKS!!! Thank you so much for the sweet gifts! XO! Hey I know that moose! Aria has one in her room. 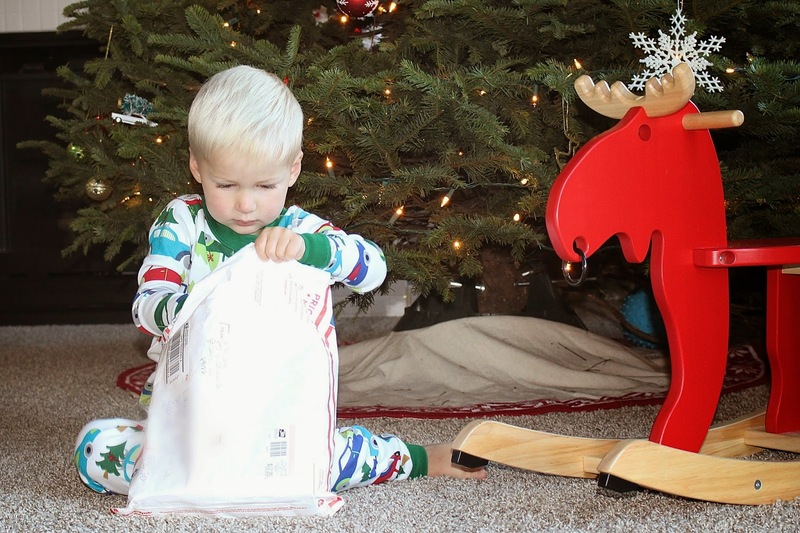 I find him to be the perfect Christmas moose rocker. I have visions of bringing him out around the holidays to guard the tree and probably be a nice little spot to put a few gifts. Currently Aria tries to stand on his antlers. I couldn't agree! Sometimes I just keep it on my nightstand! Love seeing these exchanges and finding a wonderful new blog to follow! He is so adorable and congrats on the little one on the way!